1.Style structure: Apart-style with double-column structure,each layer can be adjusted . 2.Handle: steel-made crank handle, the structure is ratchet automatically linked,it can stop at the vertical position after the closure . There's a reliable degree in the center of a straight line, so that the body frame can be balance and brisk when it sliding. Also you can move single-column or multi-column at the same time. 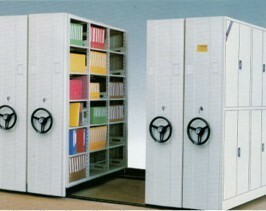 Theres a higher level of anti-theft capability and confidentiality. 5.Sealing devices: The contact surface of each column have a buffer and seal. A dust-proof plate on the base and an anti-rat plate on the bottom . There's no gap when you close up it. It has good function such as dust, fire, anti-rat and so on. 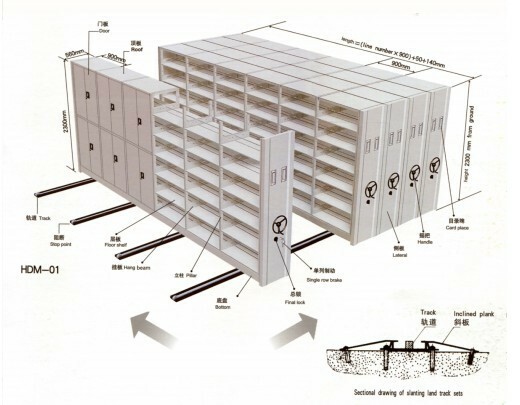 6.Load requirements:Uniform load on a single shelf is 40kg and on the double-sided is 80kg. 7.Spraying equipment: Use the most advanced automated electrostatic spray line. Parts or Supplies... and more! We can design according to customer's requirements!